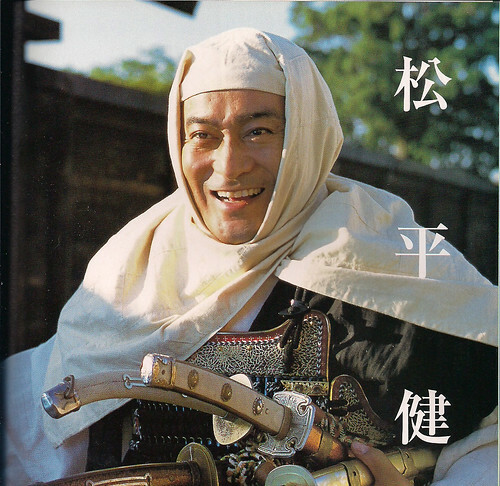 Benkei (the most famous sōhei) from the NHK Taiga Drama, Yoshitsune. So as I recover from a recent surgery, I have been thinking about getting into Cut and Thrust (Calontir’s version of rapier) after I heal up. Yesterday, the Kingdom marshal for C&T was putting together a group order for gauntlets (he could get a good price if he ordered over 10 pair) and I decided to go in for a pair. Evidently, the rules are changing and the Society is beginning to require rigid protection for the hands. Not five minutes after I posted to the interest thread than Ayisha (more properly, HE Baroness Ayisha bint Asad), a local scribe I know who is a C&T enthusiast, PM’d me asking if I was planning to get into C&T. I told her that I was interested, that I had tried rapier back in the Midrealm years ago, but as an armored fighter, I didn’t have the time/money to pursue both. She was thrilled, and said she could bring the Barony’s loaner gear to either one of the Shire meetings or Shire fighter practices (we’re actually starting to have our own, wonder of wonders) if I let her know in advance. She’d be happy to go over all the basics with me, etc. She knows I’m still healing up, so no rush. She just really was eager for a new recruit, LOL. So yeah, taking that first step. Usually I’d wait on the armor, but since this was a chance to save money, I decided to spring for the gauntlets. While I heal up, I was giving some thought to the type of kit I would like to have. I’ve admired West Kingdoms’s HE Baroness Saionji no Hana’s rapier get-up, but I was thinking more in the terms of sōhei, especially since I have been researching kato no kesa (their headgear) for awhile, and have been wanting to try to make one. Sōhei wore typical monk’s garb: kosode, ( Jikitotsu, and kukuri-bakama. Not sure with the kukuri-bakama if I could add ties directly to hakama to get the effect, or make kyahan (leg wraps). One advantage of this style is that I would not have to worry about being fancy with the fabric. This outfit was traditionally black and white (or brown and white). I liked Saionji-kimi’s idea of a shitagi for body protection and will give that a try. Obviously, geta are not a practical choice–the marshal wants closed-toe shoes. I have some jika-tabi that could work for that. Maybe for effect I could make some waraji to wear with them? The process will take some time, both to make the outfit and also figure out what kind of sword, mask/helm, and gorget I would need. I can decided that after I go through some practices and talk more with Ayisha. But this is the general plan I have in mind. I don’t mind being patient, since it took me nearly a year to build my first suit of armor when I was heavy-weapons fighting. I borrowed armor at practice (everyone knew I was building a set, so I waited my turn and no one minded) in the meantime. I figure this process would be similar. Anyway, it looks like it will be fun, and also good exercise!